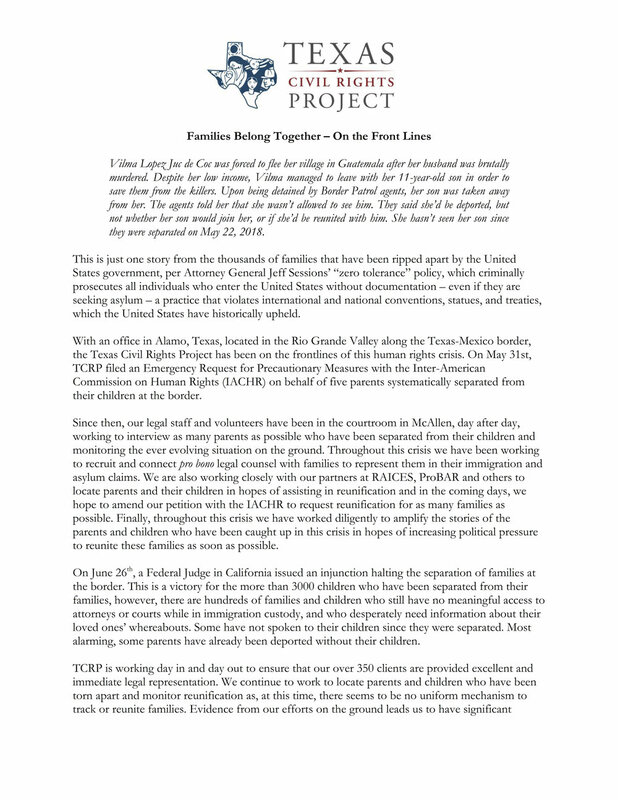 Join me in supporting the Texas Civil Rights Project as they work tirelessly to reunite families separated by the Trump administration's "zero tolerance" policy while advocating for over 350 clients across the state of Texas. My goal is to raise $2,000 for TCRP through five sales of this edition. To reach this goal, I will donate a $400 tax deductible amount of each $600 print purchase to TCRP. Below you will find my statement on this hand-carved and hand-printed woodcut, information about Texas Civil Rights Project, and stories from TCRP's clients' first hand experiences with this humanitarian disaster. This page will be updated as more information is provided to me. "TCRP is fighting around the clock to reunite the 381 families we represent and to ensure that they get excellent legal representation on their underlying immigration claims. We’ll continue to go to court every day in South Texas to monitor and protect against the ever-changing policies of the Trump Administration for as long as it is necessary. Our lawyers are working to stop family separation permanently in an action against the United States before an international human rights body called the Inter-American Commission on Human Rights. At the same time, we are working hand in hand with our partners across Texas and the country to end the Zero Tolerance policy and ensure that no human rights or civil rights violations of the nature we saw at the border these past weeks are allowed to continue, resume, or take place ever again." About my woodcut: Yucca and cactus appear in my work often- these plants signify endurance, resilience, protection, they are also a symbol of my homeland. The border wall is not something many of us in Texas, or those who live along the border want- it's a humanitarian, cultural and ecological disaster. What is currently happening here is unacceptable- the state sanctioned violence towards migrants and refugees- the psychological torture of separated families and stolen children. There are people who join the organization Border Angels to create water stations for those traveling through the desert, or simply leave jugs of water along pathways for those who find and need them. Border patrol cut open these jugs- not only wasting the precious lifesaving water inside them but also destroying the vessels so they cannot be used again. This action to me is such a simple distillation of the inhumanity of border politics and the violence of nationalism. I'm honored to have this opportunity to partner with others in supporting TCRP as they work to reunite separated families and demand that everyone involved in this crisis is treated with the dignity and humanity they deserve. "Vilma Lopez Juc de Coc was forced to flee her village in Guatemala after her husband was brutally murdered. Despite her low income, Vilma managed to leave with her 11-year-old son in order to save them from the killers. Upon being detained by Border Patrol agents, her son was taken away from her. The agents told her that she wasn’t allowed to see him. They said she’d be deported, but not whether her son would join her, or if she’d be reunited with him. She hasn’t seen her son since they were separated on May 22, 2018." Click on the documents below to read more from Texas Civil Rights Project.